With 514 salmon reported, the River Moy saw a pretty good week. Rising water levels during mid-week resulted in good fishing conditions over the weekend. Particularly, mid- and up-river fisheries enjoyed fine sport with good numbers of fresh salmon caught. 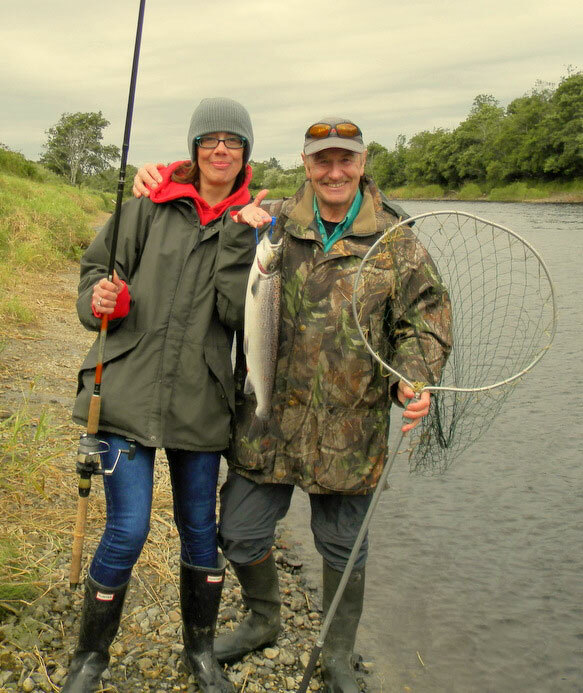 On the Knockmore water, Caroline Moore, Northern Ireland, caught her first ever salmon on bubble & fly, while Darragh Farrell, Dublin, scored on the Coolcronan Fishery where he also landed his first ever salmon. Not too long after his first fish Darragh landed another nice grilse. A proud Caroline Moore with guide Kenny Sloan. Gannon's produced a six pounder for Davy McKee, Northern Ireland, on worm, while Mark Bloomer, also Northern Ireland, had four on spinner (2 released) on the Foxford Fishery. On Rinanney, Swiss anglers, Roman Winder, Alfred Durrer and Tobias Stadler, did very well catching a total of 17 salmon. Later in the week, the group caught another two salmon while trolling on Lough Conn as well as 4 trout, best at 2 lbs. The Foxford Salmon Anglers' water enjoyed good fishing during the week with Pat Sherry landing a fine fresh-run grilse of 6.5 lbs. Fishing conditions also improved on the East Mayo Anglers Association water where Jean Yves Giraud, France, had an 8 lbs. salmon on spinner. Also on East Mayo, German fly angler, Thomas Heymer, caught a 4 lbs. grilse. Sligo Anglers Association held a comp on Glencar Lake during the week. A total of 20 anglers fished the event reporting some fine sea trout up to 44cm. A good number of brown trout was also caught and one salmon was lost in the weed. Peter McKenna won the sea trout section with Dylan Henry winning the brown trout section. Dylan finished runner up in the sea trout section, while James Ward and Thomas O'Donovan tied for 2nd and 3rd place in the brown trout section. All fish were carefully released. Sligo Anglers are planning to run a similar competition in August next year. Angling improved slightly on Lough Conn with some good bags of trout reported by anglers. Fishing out of Pontoon Bridge Hotel (relax@pontoonbridge.ie), Martin and Brian Clarke, Fermanagh, had two trout each, best at 1.5 lbs. on Wulffs. Murphy's Boat Hire (gmurphyboats@gmail.com) reported good fishing for some of their clients. Paul Caslin boated 6 trout over two evenings, best at 1.75 lbs., while Peter Grey, Castlebar, had 4 fish; all on Bibio Hopper and Green Peter. Dublin anglers, Brain and Mark Creighton, had 4 trout each on wet flies. Dapping hoppers produced 4 fish for Mick Sweeney from Loughrea; best at 1.5 lbs. Ian Wise of Cloonamoyne Fishery (ian@cloonamoynefishery.com) took 6 trout on wets; best at 1.5 lbs., while John Warren had four up to 1.35 lbs., also on wets. Patrick Mc Loughlin and David McAndrew, both Galway, caught 3 each on Green Peter patterns; best 1.5 lbs. On North Conn, Aidan Murphy and Aidan Kearney, Dublin, boated 7 trout between them; best 1.5 lbs. David Jennings, Sligo, and Richard James, Manorhamilton, also had a great day on North Conn, catching 12 trout up to 1.5 lbs. David and Richard released all their fish. After a quieter period, trout fishing on Lough Arrow improved during the week. Francis White and Thomas Walsh had a very good day on Thursday 28th Thomas caught 5 fish (one released) up to 3.5 lbs., while Francis had 6 fish (2 released) averaging 2 lbs. The two anglers landed all their fish on wet flies. Lough Arrow Fish Preservation Association & District Anglers will hold a competition on Sunday 7th September from 11.00am until 6.00pm. Weigh in for single heaviest fish will take place in McDermott's Bar, Castlebaldwin, at 7.00pm. Refreshments will be served and entries will be taken at Flynn's Pier from 10.00am until 11.00am. Alternatively, interested anglers can text any of the following committee members: Alison: 087-9541835,Karl: 086-8343584, David 086-3825376 or Sarah: 087-9734101.